Parents can influence their children’s behavior in many ways. That’s why it’s urgent that you help your child or teen seek out and participate in Cognitive Behavior Therapy (CBT). You have the power to help – or hinder – your child’s progress toward getting relief from OCD. Learn about the symptoms of OCD. By understanding OCD, you’ll be able to recognize its warning signs and better appreciate what your child goes through as he or she struggles with this disorder. Learn about CBT. This is the only scientifically-supported behavioral treatment for OCD and the one most recommended by experts in the field. In some cases, medication is prescribed along with CBT. Therefore, it’s a good idea to familiarize yourself with issues related to medications for OCD, as well. Stay informed. 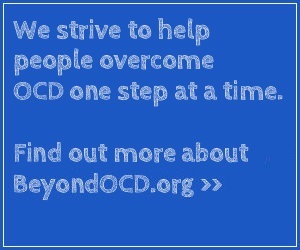 Beyond OCD wants you to have current, easy-to-understand information. That’s why we’ve developed this website. Left untreated, OCD frequently gets worse. Making excuses for behavior your child exhibits that may be symptoms of OCD won’t help. Nor will simply hoping your son or daughter is going through a phase and will just “grow out of it.” By being proactive and taking action, you’ll greatly improve your child’s chances of successfully gaining control over this potentially debilitating disorder. It’s obvious that family members – including extended family members – are integrally involved with OCD. When a child has OCD, everyone is affected by and has to live with it. But as a parent, you’re in a position to influence how the entire household operates and encourage everyone – including extended family members – help the child with OCD. Let siblings know, for example, that the child with OCD is actively working on getting better. Try to foster understanding and model for them examples of how they can interact positively with their brother or sister rather than react with anger or name-calling. Research has actually shown that by being critical or hostile, family members can worsen OCD symptoms. It’s also important, to be honest with everyone; no one likes OCD, including you. And especially not the child who battles this disorder. Encourage family members to try, to the greatest extent possible, to separate their frustration and dislike for the disorder from the person who has it. It’s not the child’s fault he or she has OCD. Many therapists regularly involve families in CBT. In fact, of the studies examining CBT for children and adolescents with OCD, those in which families were actively involved in CBT reported among the highest levels of improvement. Talk with your child’s therapist about how you and your family can play a role in your child’s recovery program. Should I Tell My Child’s Teachers About OCD? Parents must balance privacy concerns against the potential benefits of having teachers as allies in your child’s fight to overcome OCD. It’s ultimately your decision about whether or not you inform the teachers at your child’s school his or her OCD. Some parents may not wish to tell school personnel about their son’s or daughter’s OCD because of the stigma that is sometimes associated with mental illness – even in this day and age. In some cases, parents are concerned that if they confide in their child’s teachers, confidentiality somehow may be breached. But there are several potential concerns associated with not informing school personnel. First, OCD symptoms tend to wax and wane (get worse and then better). The possibility always exists, therefore, that even if OCD symptoms currently aren’t evident in school, they may be in the future. If symptoms do become problematic, teachers who lack background information about the student understandably may rely upon faulty explanations and make incorrect assumptions about those difficulties (e.g., the child is inattentive, noncompliant, unruly, etc.). Students may even be punished for OCD behavior because it was interpreted as aggressive or disruptive. Second, if a child is on medication for OCD, school personnel need to be aware of its impact on a student’s behavior, including any potential side effects. Educators who are informed about a student’s OCD are in a much better position to understand his or her behavior and provide supports that are crucial to successful school functioning. What Information about OCD Should My Child (or Teen) Have? There are many good books that provide information about OCD for children and adolescents. You’ll find Beyond OCD ’s recommendations in the More Resources section of this website. Some of the books for younger children include a parents’ guide to sharing the book with a child. Some books include games, assignments or even art projects that can help a child understand and cope with OCD. You can also read Personal Stories written by children who have been successfully treated with CBT. You can show them sections of this website, or print out sections you think would be helpful for them to read. You can direct them to the Personal Stories section of this website to read stories of young people and adults who have experienced relief from OCD by undergoing CBT. You can direct them to the “Just For Teens” section of this website, a section designed for teens who are affected by OCD. This section includes some recommended reading, specifically for teens, including an article and a book.